As Seattle has continued to grow over the past few years, obtaining gym space had become a barrier for LGBTQ sports organizations. When the Asian Resource Center changed ownership and closed the gym the group (Seattle Gay Basketball Association) was left without a place to play. Several attempts at using community centers and local schools failed as other organization and leagues took precedent on the schedule. We have re-united and established a board of directors with the mission of building a long lasting LGBTQ and Friends basketball organization. We plan to hold leagues year-round complemented with fun tournaments and social gatherings. We want to be more than just a basketball league, we want to build a community of like minded people having fun and playing a sport they all love. 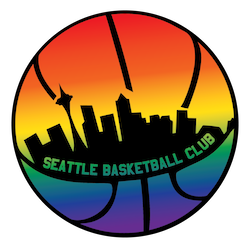 The first organization to bring LGBTQ+ basketball to Seattle was called Jet City Hoops (JCH) and it was Seattle's only LGBTQ+ & friends basketball league. It was also the largest organization on the West Coast and 3rd largest league of its kind in the entire nation! JCH was open to players of all skill levels and offered a fun, safe and friendly way to get active, meet new people and enjoy basketball. JCH continued to grow over the years and had both recreational and competitive divisions that played at Miller Community Center in Capitol Hill. JCH then morphed into the Seattle Gay Basketball Association when Miller no longer had gym time for the league. SGBA played several seasons at the Asian Resource Center in Beacon Hill until that facility was closed. Fast forward a few years later and here we are with the opportunity to build upon the tremendous foundation that JCH and SGBA both created in Seattle. We are following the same guiding principles that made the other organization successful.